MIT alumna Danielle Wood will establish a new research group at the Media Lab aimed at harnessing space engineering to improve life on Earth. Danielle Wood (SB ‘05, dual SM '08, PhD '12) is the Media Lab’s newest assistant professor in the Program in Media Arts and Sciences. She will officially start working at the Lab on January 16, to establish a new research group, called Space Enabled. Her mission is to advance justice and development in Earth's complex systems using designs enabled by space. 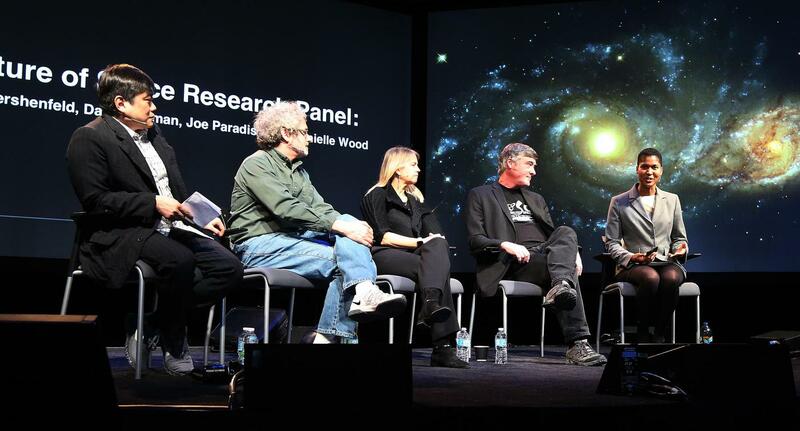 “Let’s keep striving for the ideal that space really is for the benefit of all humankind,” Wood said at a Media Lab event in March when she took part in a panel discussion about the future of space research. A scholar of societal development with a background that includes satellite design, systems engineering, and technology policy for the US and emerging nations, Wood added that “space research is just a link in a bigger chain, part of a broad system of technology and art and science and design.” Her passion, she said, has been in designing satellite systems that serve societal needs while integrating new technology. Growing up in Orlando, where she frequently witnessed space shuttle launches, Wood was inspired by how NASA teams came together to achieve such precise and challenging missions. But she also wanted to find opportunities to serve people directly in her career. Ultimately, that combination of interests led her to study aerospace engineering, policy, and international development. As a doctoral student at MIT, Wood traveled to 15 countries over 10 months as part of in-depth research on new satellite programs in Africa and Asia. The study explained how governments can harness international collaboration to foster domestic capability building and national development. In setting up the new group, Space Enabled, Wood plans to reduce barriers to applying space technology for societal benefit. Her research pursues a four-fold cycle that includes observation, explanation, co-design, and evaluation of complex systems that deliver public sector services, using methods from engineering and social science. “I am particularly interested in areas such as environment, health care, education, and law enforcement,” Wood explains. “These public service systems foster justice and societal development when they provide equitable access and high-quality service to consumers across the socioeconomic spectrum.” To that end, her group will partner with communities in the US and abroad on long-term projects to implement new designs enabled by capabilities from space, such as satellite-based earth observation. Danielle ties space, development, and earth sciences together in a unique and impactful, Media Lab-like way. Wood’s group will include researchers and staff who bring together “multiple, seemingly unrelated interests. Some of the skill sets relevant to the projects I plan to pursue include engineering, design, technology policy, law, social science, geography, earth science, public health, history, art, and data analytics.” The Space Enabled team will not work in isolation: Wood says she expects to collaborate with other research groups at the Media Lab and also contribute to its Space Exploration initiative. Danielle Wood (right), talking about the future of space research with (from left) Media Lab Director Joi Ito; Neil Gershenfeld, director of MIT's Center for Bits and Atoms; Dava Newman, MIT professor of Astronautics; and Joe Paradiso, who heads the Lab's Responsive Environments group. Currently, Wood serves as the Applied Sciences Manager at NASA’s Goddard Space Flight Center, where she focuses on using earth science findings for societal applications, such as food security and water resource management. Previously, she served as special assistant and advisor to NASA’s Deputy Administrator, and prior to NASA, she worked at the Aerospace Corporation, Johns Hopkins University, and the United Nations Office of Outer Space Affairs. At MIT, Wood earned a PhD in systems engineering, SM in aerospace engineering, SM in technology policy, and SB in aerospace engineering. At the Media Lab’s “Beyond the Cradle” event, Wood said that during her time at the Institute she was inspired by the expansion of space activity around the world and the potential uses of data captured by satellites. “But the question then becomes, how does the average person take advantage of that information? I look forward to co-designing solutions with communities to empower them to use space to make their own lives better. This is important in areas like food security, disaster response and monitoring the spread of diseases influenced by environmental factors.” During her time at MIT, Wood was awarded five fellowships, not only from MIT but also from the National Science Foundation, the National Defense Science and Engineering Graduate program, and NASA’s Harriett G. Jenkins Predoctoral Fellowship Program. 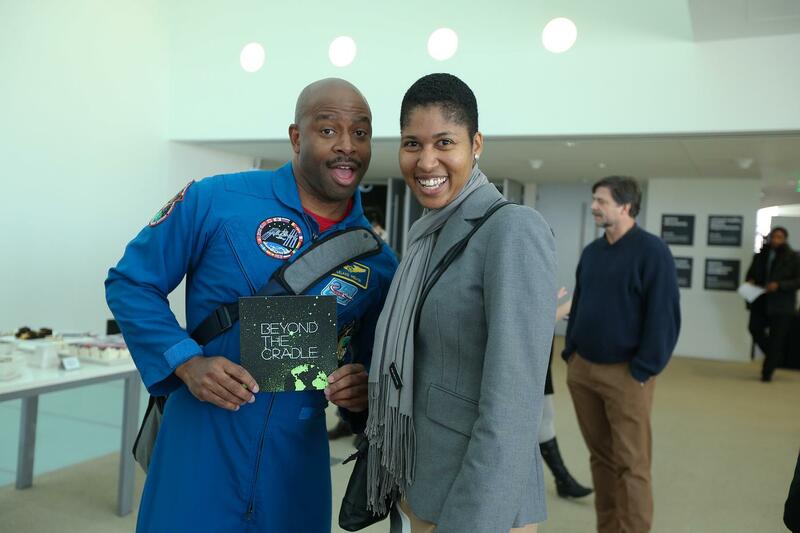 (l-r) Former astronaut Leland Melvin, currently a Director's Fellow, with Danielle Wood at the Media Lab's "Beyond the Cradle" space event in March this year. Wood’s work has drawn widespread recognition. She has won grants from the Future Space Leaders Foundation (2016) and the National Science Foundation (2013), and she’s received awards from many organizations, including the Global Competitiveness Conference (2015), the International Astronautical Federation (2012), and NASA (2010). Wood has presented her research through many scholarly publications, conferences, and invited talks across Africa, Asia, Europe, Australia, and North America.